The Finney Law Firm is proud to announce three “wins” in 18 months before the U.S. Supreme Court, a remarkable accomplishment for a firm as young and as small as ours. However, our persistence, positioning, strategizing, foresight, and argument prevailed in three different cases in two terms of the U.S. Supreme Court, two in the 2013/2014 term, and one in the 2014/2015 term. We carefully place the term “win” in quotes for several reasons. First, each of the three cases did result in both the U.S. Supreme Court accepting the cases and ordering the relief our firm sought on behalf of our clients. Second, only one of the three cases actually had oral argument before the Justices. The other two cases closely tracked issues in a case argued before the High Court and, thus, we achieved reversal only on written pleadings. Finally, each of the three cases was not finally “won” by the U.S. Supreme Court ruling, but rather resulted in “reverse and remand” and “vacate and remand” orders from the Court, remanding all three back before the 6th Circuit Court of Appeals and ultimately the U.S. District Court for further proceedings. Two “wins” in 2013/2014 term of the Court. In 2010, lawyers from the Finney Law Firm on behalf of an Ohio-based political action committee, COAST, commenced litigation to defeat what we believe to be an unconstitutional Ohio statute empowering a commission in Columbus to sit in judgment of the truth of statements made during the course of political campaigns, subjecting speakers to criminal penalties for offenses. We brought a second such case for COAST Candidates PAC in 2011 in response to new charges being brought against our client. While these two cases commenced in 2010 and 2011, over the past five years our attorneys have argued this same issue in other cases before a total of three U.S. District Court Judges and one state court judge, and all of the 15 Judges on the Sixth Circuit Court of Appeals, and lost at every turn. Still, we were convinced of the correctness of our client’s position, and thus pursued the matter before the nation’s highest Court. This year, the United States Supreme Court agreed to hear both of our cases. The U.S. Supreme Court typically accepts fewer than 1% of all cases submitted to it for review, out of more than 10,000 applications of petitions for writs of certiorari (i.e., requests for the Court to hear a case) filed annually, so merely getting the cases accepted for review was a major accomplishment. The briefing and positioning of the two cases for acceptance and victory at the U.S. Supreme Court required proper positioning and precise briefing before the nation’s highest court. Ultimately, our client’s position was supported by 67 groups filing 22 “Amicus Briefs,” including the United States of America, the Ohio Attorney General, the American Civil Liberties Union, Citizens United, the Republican National Committee, and the Cato Institute. The Solicitor General of the United States argued before the 9 justices on the Supreme Court along side COAST’s attorney for the position we advanced. 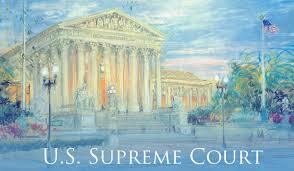 In June, the US Supreme Court decided the two cases in our client’s favor, both 9-0 victories for our clients. You can read the key decision, authored by Justice Clarence Thomas in Susan B. Anthony List and COAST v. Ohio Elections Commission here. Interestingly, in both cases, this is just one juncture in a very long path of litigation, as all this victory did was gain COAST the right to sue, or “standing,” putting us back in the Federal District Court for discovery and a trial. The case will take another two-to-three years to be finally resolved. We are proud of what we achieved in these cases, but we are even more excited about what we have learned along the way. These experiences will help us to “make a difference” for all our clients in the future. The case of Wagner v. City of Garfield Heights, Ohio started in 2011, when our client Frank Wagner was cited for placing a 4’ x 4’ sign in his yard criticizing his local member of City Council. The City claimed to prosecute Wagner because of the size of the sign, not its content, but (i) it allowed for dozens of 2’ x 2’ signs, but outlawed the single larger sign, and (ii) discriminated against political signs in various districts of the City. We positioned the suit against Garfield Heights as both an illegal “time, place and manner” restriction (i.e., the irrational restriction on the size of the sign) and an unconstitutional “content-based” restriction. The trial Court sided with us on the content-based basis, and ruled for Wagner. The 6th Circuit Court of Appeals, looking to the intent of the content restriction, found for the City, and thus our client had lost. In late 2014, we were confronted with throwing in the towel, or appealing to the U.S. Supreme Court, where more than 99% of appeals are sent to the graveyard of never-heard pleas. But we knew something — the Supreme Court only weeks earlier had accepted a case from Arizona — in which a Church was placing directional signs on Sunday morning promoting their Church services. It addressed the same content-based issue our case did — what did the City intend with the restriction And the issue was — did the intent matter, or was the simple content discrimination enough. That case — Reed v. Town of Gilbert, AZ — was heard at oral argument in January of 2015. So, we filed a “me too” petition in the Wagner case, raging that if the U.S. Supreme Court ruled for Pastor Reed in the Arizona case, they should also rule for Wagner in the Ohio case. And they agreed. At a conference in March of 2015, the Court held its conference — the same type of session where 99% of cases are sent to the graveyard — and … did not rule. They neither accepted the Wagner case nor dismissed it. But this inaction was a huge win for our client, as we knew that they were holding Wagner pending decision in Reed. And that’s what happened. In June of 2015, the U.S. Supreme Court ruled in favor of Pastor Reed, and found the City’s sign ordinance unconstitutional. And ten days later they held a second conference on the Wagner case, and “vacated” the decision of the 6th Circuit Court of Appeals and “remanded” the matter back to them for further action consistent with their Reed decision. In short, Frank Wagner won. We are deeply proud of our Constitutional Law Team, and the win they achieved in this case, as it is a victory for this client, but we are also pleased that they advanced the mantra of our firm in “making a difference,” which we seek to do for every client. Please contact us to allow us to help “make a difference” in your personal or business affairs.